Meet at the Sycamore roundabout beside the pathway. Help artist Wilma Wyss build a mosaic along the Mill Valley Sausalito Pathway to celebrate native and marshland plants. 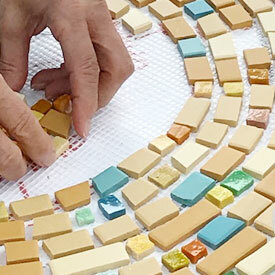 The artist will lead the group in tile craft, to prepare for installing the mosaic later in June. Volunteers can also help plant 1-gallon shrubs, adding habitat for local birds and butterflies. Children over ten years old are welcome with adult supervision. Spaces are limited. Sign up with Eventbrite to assure a spot. This project is part of the Dedication Program. Learn more about how you can celebrate loved ones in Marin County parks. Directions: From Hwy 101 in Mill Valley, take the exit for E Blithedale Ave west 0.7 miles. Turn left onto Camino Alto, left onto Sycamore Ave, and follow to end (dead end).